My friend Lina is a marine. For some reason her animal is a llama, complete with hand gestures. When she was first shipped to Afghanistan, her sister and I conspired. 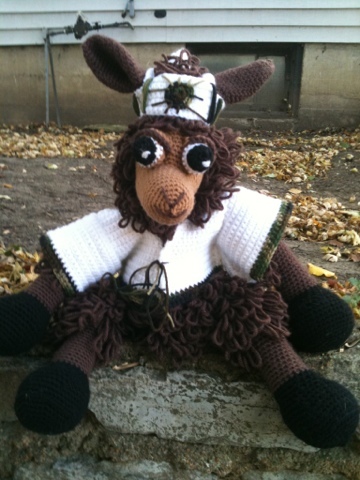 I made Lt Llama from a pattern from deliciouscrochet.com, with minor modifications. Mainly, I made her a helmet. 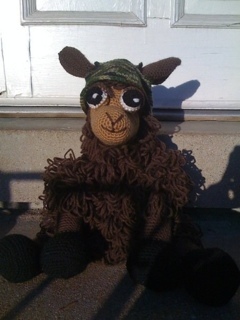 Lt Llama then traveled between Lina’s family and friends and we sent her pictures while she was deployed. Good Luck Lina and stay safe. Happy Veterans Day. Remember those men and women who protect and serve this country and all those who have. Make sure to check out the patterns a Delicious Crochet. She is awesome. I’m addicted to her patterns.